For those who have small space in their rooms but yet can not help themselves without a dehumidifier, this Prem-I-Air mini size compact dehumidifier is the way to go. It comes in a very small body and is designed for every day use specially in homes where humidity tends to vary a lot due to inconsistent climatic conditions. This compact dehumidifier runs on mains power and consumes up to 650 Watts. The dehumidifier has an integrated timer which can be set to a maximum of 8 hours which is just about perfect when you want to turn this device ON or OFF after sometimes. The product offers 4 levels of humidity such as 40%, 50%, 60% and Continuous mode. This small Dehumidifier is ideal for rooms no bigger than 30 square meters. Ideal for drying cloths as it has both winter and summer laundry modes which helps remove moisture from air by providing warm air which aids the process of drying of cloths. Contains advanced filter technology for filtering and killing bacteria, dust mites etc. 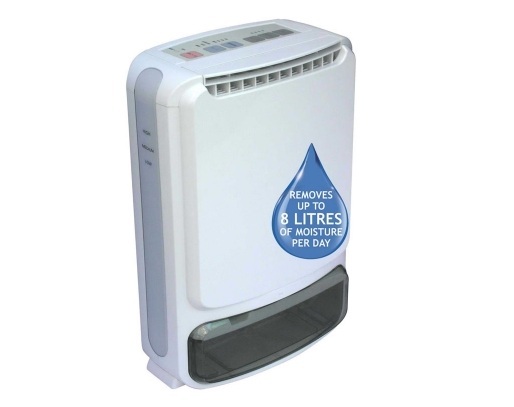 This mini dehumidifier will also help in air purification and removal of unpleasant smell. 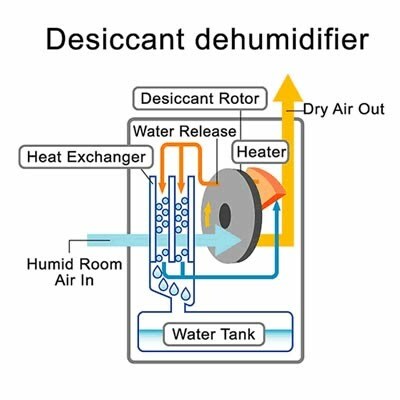 The compact dehumidifier can extract water at a remarkable 8 L / day which is quite an amount for a dehumidifier of such a small size. Its automatic modes will maintain room humidity and will also prevent condensation. This small dehumidifier is ideal for cellars, caravans, boats, garages etc. The auto restart feature in this dehumidifier is also a plus which will let this device start on its own after a power failure. The electronic control panel lets you control lots of parameters such as fan speed, timer, humidity and offers other handy options. Overall this Small Dehumidifier by Prem-I-Air is a smart, compact yet very handy for a dehumidifier weighing just 6 kg, we rate it 8/10 for its small size, competitive price and lots of other handy features.